Posted on Wed, Mar 21, 2012 : 5:11 a.m.
Anne Mills McCauley's "linger" exhibit at the University of Michigan Residential College Art Gallery is a contemplative affair that invites us to—well, linger for a while. The display’s 20 artworks—featuring this Albion College art professor’s near-monochromatic expressive drawings—are introspective in a peculiarly suggestive abstract manner. But the meaning of these artworks is obscured by their relative lack of detail—as well as often seemingly random placement. McCauley’s division of foreground and background visual elements—elementary geometry and random items like sea shells and surface texture against indistinct backgrounds—create internal tensions whose relief is crucial to her pictorial strategy. All of which is to say that “linger” is certainly an appropriate way to approach McCauley’s art, because one of most useful ways to appreciate what she’s doing is to surrender oneself to her art and allow its subtle inner dynamics to go to work. The wonder is that by using modulated palettes with only elementary elements floating about their foreground, McCauley creates striking tensions. This strategy is illustrated in a work titled “grace,” in which a mottled brown background supports an accordion of horizontal lines on a gray grid that sits in the work’s center. The contrast of foreground and background alone is enough to activate the composition, but McCauley’s undulating gray horizontal grating works in contrast to the undifferentiated void of the drawing’s background. In other instances, McCauley crafts her imagery in such a manner as to create elusive visual gestalts that add additional complexity . Thus a log in her “proximity” also vaguely looks like a pepper dispenser when viewed from a distance because of a spray of stray dashes beneath it. 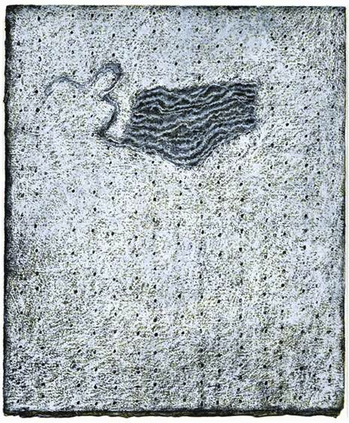 The exhibit’s masterwork is the graphite and oil pastel on paper “traverse,” where a rank and file of black marks runs across the work to create a dappled gray background. Centered in the work’s upper third is a band of foreground horizontal knotted lines whose bottom coil trails across the drawing. There’s indeed an enigmatic “traverse” taking place here. In a fundamental manner, “traverse” dares its viewer to peruse its inaccessibility. And when you do, you’ll be seduced by its unreachable placidity. You will undoubtedly linger. “Anne Mills McCauley: linger” will continue through April 7 at the University of Michigan Residential College Art Gallery, 701 E. University St. Gallery hours are noon to 6 p.m., Wednesday-Saturday. For information, call 734-763-0176.